This limited edition print completely sold out after publication in 1991. The Vought F4U Corsair was arguably the best American fighter of WWII, and it is generally accepted to have been the best carrier-borne fighter of the war. Its pilots destroyed well over 2000 enemy aircraft achieving an 11-1 victory ratio - an outstanding record for a fighter that didn't enter service until early 1943. The first carrier-borne F4U Corsairs were operated by the Royal Navy's Fleet Air Arm during attacks against the Tirpitz, and the distinctive gull-winged fighter saw service with nineteen FAA Squadrons, mostly in the Far East. But it was in the hands of the US Navy and Marine pilots in the Pacific that this outstanding aircraft made its greatest contribution to the Allied war effort, the 400 mph single-seat fighter proving a formidable opponent in any role its pilots chose. 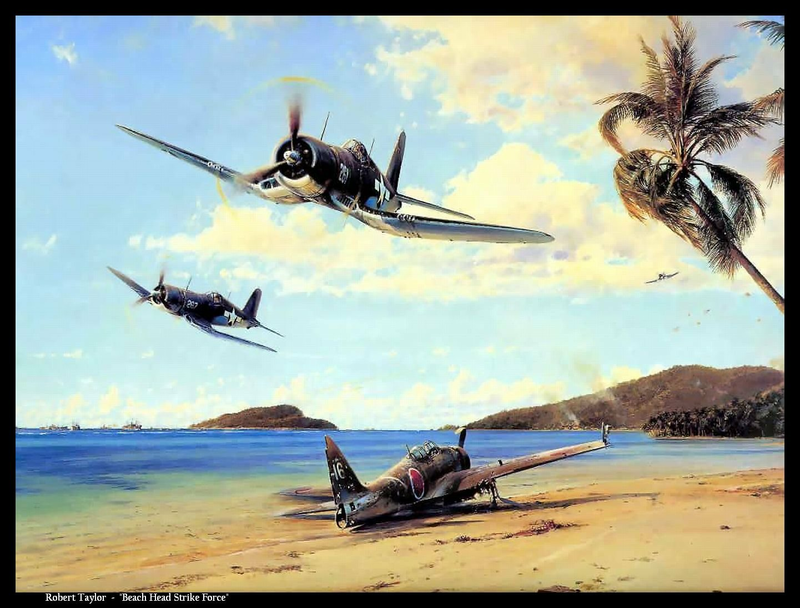 Robert Taylor's magnificent painting features a gaggle of F4U IAs on a low-level strafing run during Allied landings in the Marshall Islands in 1944. Below an AM6 Zero lies decaying on the beach, the victim of an earlier aerial contest. In the distance Allied shipping bombard enemy positions while landing-craft bring the invasion force ashore.